Cable Glands We are into the manufacture and export of a wide range of Cable glands. These are widely used in different industries for securing various cables to instrumentation and control equipment. It provides secure and fast connection of cables and wiresin various industries ranging from equipment and machinery manufacturing, measuring & control electronics, automation, electrical and robotics. Known for their dimensional accuracy, the product array includes Spiral Cable Glands, Flexible Cable Glands, Corrugated Pipe Glands and Straight Cable Glands. Flu-con range of cable glands are produced as per IEC and BSEN standards and are CE marked. Flu-con range of products are manufactured at our mumbai plant and are marked to all major national and international markets. Cable Glands We are into the manufacture and export of a wide range of Cable glands. 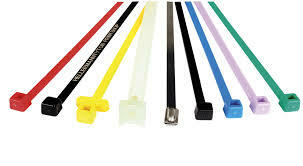 These are widely used in different industries for securing various cables to instrumentation and control equipment. It provides secure and fast connection of cables and wiresin various industries ranging from equipment and machinery manufacturing, measuring & control electronics, automation, electrical and robotics. Known for their dimensional accuracy, the product array includes Spiral Cable Glands, Flexible Cable Glands, Corrugated Pipe Glands and Straight Cable Glands. Flu-con range of cable glands are produced as per IEC and BSEN standards and are CE marked. Flu-con range of products are manufactured at our plant and are marked to all major national markets. A cable tie or tie-wrap, also known as a hose tie, or zip tie, is a type of fastener, for holding items together, primarily electric cables or wires.